2 hurt after car slams into bus stop in Darby Twp., Pa.
DARBY TOWNSHIP, Pa. (WPVI) -- Police are investigating a crash that injured two pedestrians at a bus stop in Darby, Pa. It happened after 1 p.m. Tuesday in the 1500 block of Lansdowne Avenue. 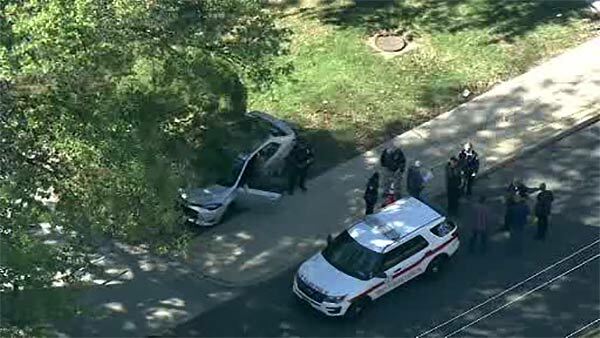 Police say two people were hurt when a car crashed into a SEPTA bus stop shelter. Video from Chopper 6 HD showed a gray sedan parked on a grassy area next to the road. A heavily damaged bus shelter was seen a short distance away. Medics took the injured pedestrians to be treated for injuries described as non-life-threatening. Several police units remained on the scene as investigators worked to determine what led to the crash.